Yes, You Can Can Yeast Starter! Make up your yeast starter solution ahead by using a pressure cooker. The canned yeast starter solution keeps until needed. And it’s a safe and inexpensive way to have ready all you need for your yeast to thrive quickly and effortlessly.Don’t have a pressure cooker? You can probably find one to borrow if you ask around. Canned Yeast Starter waiting for the next batch of Home Brew! Check jar manufacturer for the jar capacity and safety instructions. Don’t skip the safety guide as it is dangerous otherwise. 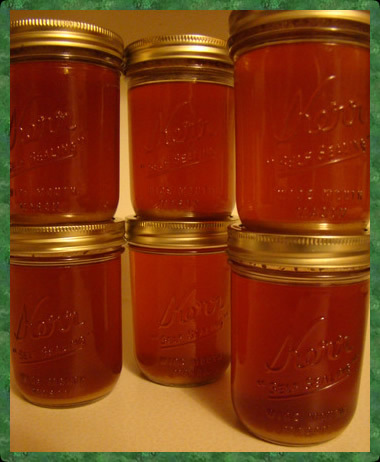 Place Dried Malt Extract in a clean glass canning jar. Put prepared jars into the cooker making sure that you have a wire basket to elevate the jars off the bottom. They will break if allowed to “bounce” in the boiling water. Cook for 15 minutes at 15 pounds pressure. This achieves a temperature of about 250 degrees Fahrenheit and kills bacteria. Kill heat and allow to cool until there is no pressure in the cooker. Check the gauge to be sure! Cool completely – Do NOT release pressure manually as it has super-heated steam and will burn! Label your jars with date and amount of DME. Store until needed – and be thankful for the time you save when you use each one. Each canned yeast starter solution may be used when needed. Your savings in time is tremendous over doing each yeast starter individually. If you don’t have a pressure cooker, you may be able to borrow one. They are fairly inexpensive to buy. You may even find another homebrewer who would share the cost and use of the cooker. Enjoy your time saving effort with each cool brew using canning yeast starter. If you liked Canning Yeast Starters then for more informative articles in Black Bucket Brew Magazine.Subscribe Now for your free emailed copy!